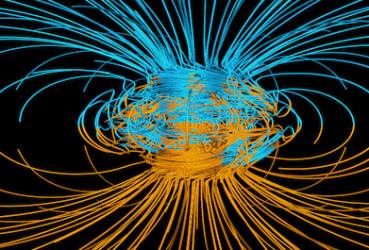 What Keeps the Magnetic Fields in Planets Alive ? Great progress has been made in the numerical simulation of planetary dynamos, though these numerical experiments still operate in a regime very far from real planets. For example, it seems unlikely that viscous forces are at all significant in planetary interiors, yet the more weakly forced numerical simulations display a significant dependence on viscosity, and indeed in some simulations the dynamo mechanism itself is viscously driven, taking the form of helical flow within columnar convection rolls (so-called viscous Ekman pumping). Given that laboratory dynamo experiments are even farther from a planetary regime, there is still no widespread consensus as to the basic dynamo mechanism at work within planetary cores. However, there is a striking similarity in the observed external magnetic fields across the terrestrial planets and gas giants, and so it seems natural to suppose that the underlying dynamo mechanism is simple, robust, independent of viscosity, and insensitive to mechanical boundary conditions, such as the existence of a mantle. In this talk one such mechanism is proposed which relies on the spontaneous emission of helical waves within the planetary core driven by the strong buoyancy flux in the equatorial plane. Peter Davidson is a professor of fluid mechanics at the Department of Engineering in the University of Cambridge. Having worked in industry both in the UK and the USA for several years, he joined Cambridge in 1994. His research interests include turbulence and magnetohydrodynmics.